Others build and ship without testing. Not Banks. Our Ram-Air Intakes start out as CAD software prototypes and are put through flow simulations. The design is refined until the simulation shows optimal performance. Then a hardware prototype is made and the design is validated on a flowbench. After that comes dyno testing and on-vehicle testing. It takes a superior design to pass all those tests. Banks Ram-Air is the only aftermarket intake with bellows. This accommodates engine movement and prevents component damage for longer service life. Give us a call at 714-848-2170 M-F from 8-5 PST – We will answer your questions regarding the Banks Power Ram-Air Intake System. Ask about Free Shipping! Live locally? Feel free to stop by our location and meet us! OC DIESEL, INC. is located at 17242 Gothard Street, Huntington Beach, CA 92647 Suites A and B. In addition to carrying Banks Power Ram-Air Intake System, we have a full service shop staffed with knowledgeable technicians who are ready to squash any Diesel Repair issues. Electric fans keep your engine cool, and improve the horsepower and torque at the wheels by eliminating the parasitic drag of the stock belt-driven fan. Dual 15 inch S-blades move 5500 CFM! Recover 27 Horsepower and boost your fuel mileage by 6% just by eliminating your stock clutch fan assembly. Give us a call at 714-848-2170 M-F from 8-5 PST – We will answer your questions regarding the Flex-a-Lite Electric Engine Cooling Fan. Ask about Free Shipping! Live locally? Feel free to stop by our location and meet us! OC DIESEL, INC. is located at 17242 Gothard Street, Huntington Beach, CA 92647 Suites A and B. In addition to carrying Flex-a-Lite Electric Engine Cooling Fan, we have a full service shop staffed with knowledgeable technicians who are ready to squash any Diesel Repair issues. How Often Should I Clean and Service My S&B Filter? The capacity of an air filter is directly related to how often you must service your filter. Capacity is defined as the total amount of contaminants/dirt particles that the filter will hold before reaching its termination point. The termination point is a predefined restriction number that is used as the cut-off point when measuring how much dirt a filter will hold. For typical passenger cars and light-duty trucks, 10” H2O is used at the termination point. In OE applications, a new filter must be purchased every time the filter reaches maximum capacity. Not only is this costly, but it also creates unnecessary environmental waste. When an S&B intake kit or performance air filter is installed, you simply clean and re-oil the air filter per S&B’s specifications. Keep in mind that the conditions that the vehicle is operated under will determine how quickly it will take a specific filter to reach its capacity. With this being said, you can compare the ISO 5011 test results to find the difference in capacities for the OE air filter and the S&B air filter on the Orange County Diesel website just look up the part and click on the “extended information” tab. The spreadsheet below is the Service Factor for each filter, this compares how the frequency of Servicing the Filter is affected. For example, if the S&B filter capacity is half that of the OE filter, the Service Factor is twice that of the OE filter. Simply put, you will have to clean the S&B filter in half the time you would normally take for an OE filter to load. It is extremely important to clean and oil your filter correctly. Instructions, oil amounts and other pertinent information regarding S&B filters can be seen on the Orange County Diesel website in the description of each filter or intake and can also be found in the manual for the product under the “extended information” tab. Give us a call at 714-848-2170 M-F from 8-5 PST – We will answer your questions regarding S&B filters. Ask about Free Shipping! Live locally? Feel free to stop by our location and meet us! OC DIESEL, INC. is located at 17242 Gothard Street, Huntington Beach, CA 92647 Suites A and B. In addition to carrying S&B filters, we have a full service shop staffed with knowledgeable technicians who are ready to squash any Diesel Repair issues. S&B Performance Intake Kit? How much horsepower will I see? Will it increase fuel economy? Horsepower can be increased by increasing airflow to the vehicle’s engine. 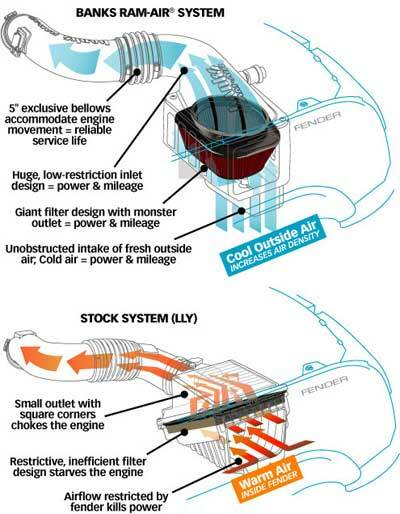 Typically, the OE stock air box and induction tube significantly restrict the airflow. S&B design’s its intake kits to increase the amount of horsepower by 5-10% by allowing the engine to breathe easier. S&B does not publish horsepower results specific to each part because the majority of our competition makes outrageous horsepower claims that are unsupported and often are accompanied by the disclaimer “Up To, As Much As, or Results May Vary.” There is no standard for dyno testing, it is difficult to hold our competition accountable for their inflated claims. S&B utilizes its 1/2 million dollar, climate controlled lab to test its intake kits and filters to the same standard (ISO 5011 Test Standard) used by the OE manufacturers, so there is substance behind S&B’s test results. 1. Airflow Rating: This rating shows how much the filter/intake improves the airflow vs. stock. Improving the airflow results in more power and better fuel economy. 2. Efficiency Rating: Protecting your engine while dramatically improving the airflow is S&B’s competitive advantage which is why we post the efficiency numbers along with the airflow rating. The efficiency rating shows how much dirt our filters will stop. Our minimum goal for efficiency is 99.0%. Will an S&B cold air intake kit provide me with an improvement in fuel economy? The simple answer is yes. By lowering the restriction level vs. stock, the S&B intake allows the engine to work more efficiently which will improve fuel economy. According to the Department of Energy, a dirty air filter will have an adverse affect on fuel economy. Fueleconomy.gov states that replacing a clogged air filter can improve your car’s gas mileage by as much as 10 percent. The reason a clean filter improves fuel economy is because it is less restrictive than a dirty filter, so the engine works less to consume the air it needs. This S&B intake kit is substantially less restrictive than the OE induction system with a clean filter installed thus allowing the engine to breather even easier which results in better fuel economy. S&B does not make a specific claim with regards to fuel economy because there are too many factors that can affect your miles per gallon. Give us a call at 714-848-2170 M-F from 8-5 PST – We will answer your questions regarding the S&B cold air intake kit. Ask about Free Shipping! Live locally? Feel free to stop by our location and meet us! OC DIESEL, INC. is located at 17242 Gothard Street, Huntington Beach, CA 92647 Suites A and B. In addition to carrying S&B cold air intake kit, we have a full service shop staffed with knowledgeable technicians who are ready to squash any Diesel Repair issues. S&B’s performance intake kits are all about improving your trucks engine. It’s just a matter of exceptional design. 1. It’s all about airflow. Filtration is what separates S&B from their competitors. S&B is able to provide exceptional airflow characteristics without sacrificing efficiency. 3. Your truck’s warranty is safe. Installing a S&B Intake Kit will not void your trucks warranty. If a dealer does deny your warranty repair, S&B will quickly reimburse you for the repair and will pursue the dealer to recoup the cost. 4. S&B actually makes it. How can S&B offer such a great deal? Easy, they actually manufacture their products. Other competitors are more expensive because they have to purchase some or all of their components from other companies. Give us a call at 714-848-2170 M-F from 8-5 PST – We will answer your questions regarding the S&B’s performance intake kits. Ask about Free Shipping! Live locally? Feel free to stop by our location and meet us! OC DIESEL, INC. is located at 17242 Gothard Street, Huntington Beach, CA 92647 Suites A and B. In addition to carrying S&B’s performance intake kits, we have a full service shop staffed with knowledgeable technicians who are ready to squash any Diesel Repair issues.